On several recent posts and comments to people have wondered how our view of public education might differ from that which is presently being proposed. While a variety of our prior posts have given major dos and don'ts of such a viable plan for education reform, today I would like to take a microcosm look at only one aspect of what should go on in an American public school that would have a profound effect on the students being educated, even though it is not normally given the important place it should have in a discussion of school reform. At nutrition and lunch every day, I would watch my students eat greasy and highly processed chicken nuggets or pizza that occupied the menu several times a week, while the melon, apple, salad, and vegetables wound up getting thrown in the trash. If someone -- whose parents had perhaps gone through the Great Depression -- did not take this food and stop on the way home to give it to the homeless, it was essentially wasted everyday. What drives this school lunch program are the food stuffs e.g. milk, apples, etc., that the federal government buys from farmers throughout this country to keep them out of the market, thereby keeping prices up. Food is not seen as an integral and necessary part of nurturing the complete student, but rather as a clever way to feed students while artificially maintaining price supports. Therefore, it is no accident that most students who were in my class were moderately obese. Having spent 7 years in France as a teacher where my children were "formed" by French public education, I was intrigued by a current Time magazine article that examines this apparently unimportant aspect of French education and shows what an integral part of the complete formation of a child it is. While there has been some degree of improvement in the menu that LAUSD offers its students, it cannot compare with French schools where "no single meal is repeated over the 32 school days in the period, and every meal includes an hors d'oeuvre, salad, main course, cheese plate and dessert." 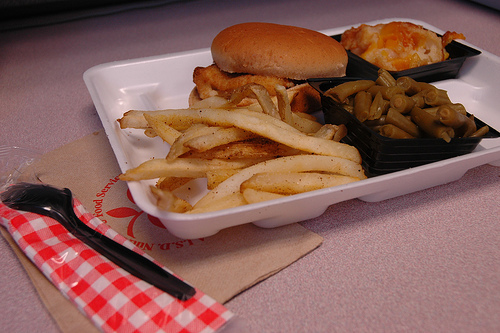 School officials even recommend what you might have for dinner given the schools' daily menu. "Americans struggling with obesity epidemics have for years wondered how the so-called French paradox works: How does a nation that ingests huge quantities of butter, beef and cakes keep trim and have such long lives?" Well the answer is in a balanced diet of wholesome food that young people are acculturated to from the time they are in creche (state sponsored childcare that starts as early as 3 months after a child is born), through école maternelle, a sort of pre-kindergarten. In this system, children at the earliest of ages are exposed to healthy French cuisine where they learn to eat while sitting around a small table in a civilized manner with their friends. Civility and healthy food are part of the preconditions necessary for a successful model of public education. In California, we now have approximately 10% of our population suffering from Type 2 diabetes, something that was virtually unheard of in children when I was a child not so many years ago, but before the pervasive use of high fructose corn syrup, saturated fats, and other frankenfood like the highly processed chicken nuggets and pizza that continue to be served in public school cafeterias with no awareness of the deferred costs in healthcare and lessened worker productivity they surely engender. Diabetes among the Latino population in California is almost twice that of the state average. "Public schools in France are overcrowded, rigid and hierarchical... ," says Vivienne Walt in the Time magazine article. She goes on to say, "I do know that on Feb. 4, [my son] ate hake in Basque sauce, mashed pumpkin, cracked rice, Edam cheese and organic fruits for lunch. That meant stuffed marrows and apples for dinner," since engaged French school officials also give "suggestions for the evening meals...that too changes daily." In retrospect and in light of my experiences living in France and Italy, a common theme of my getting into trouble with LAUSD is that I have lived in places where my presently obese and not engaged students would have had a better chance of reaching their potential. Having that awareness makes the monotonous and unhealthy mediocrity of LAUSD all the more difficult to abide. ‹ Where Does Reform Go From Here?